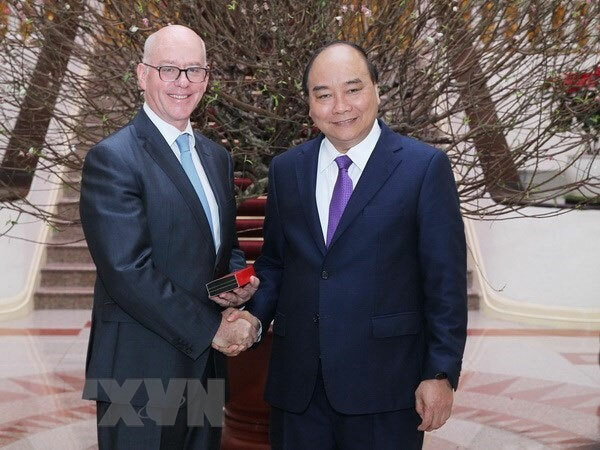 VietNamNet Bridge – Prime Minister Nguyen Xuan Phuc hosted a reception for chief representative of the International Monetary Fund (IMF) in Viet Nam Jonathan Dunn in Hanoi yesterday. The PM recognised Dunn’s significant contributions to Vietnam since starting his mission in the country in 2015, and said he hoped that in his next position as Deputy Director of the IMF’s Regional Office for Asia and the Pacific (OAP) in Japan, Dunn would continue serving as a bridge to develop relations between Vietnam and the IMF. He asked Dunn to continue providing timely recommendations for Vietnam, especially regarding monetary policies in the context of complicated international developments. The Government leader suggested the IMF co-operate and support Vietnam in reviewing, evaluating and updating information and statistics on the non-observed (informal) economic sector, which makes up a considerable portion of the nation’s gross domestic product. Dunn thanked the Vietnamese Government and relevant agencies for their co-operation over the years. He rated highly the Southeast Asian country’s development and economic policies with its improved resilience to external shocks. He said he will relay the Prime Minister’s recommendations to IMF leaders and that the IMF will help Vietnam better measure its national output.